German Football is on a roll: winners of the 2014 World Cup, Bundesliga club sides leading the way in Europe, a production line of superb talent coming through the system. Yet, fifteen years ago – at Euro 2000 – it was all so different. Germany suffered one of their most humiliating tournament exits as dismal performances saw them finish bottom of their group with just one point… Immediately, the German FA set about fixing things. And rather than fudging matters, they introduced a raft of major changes designed to return German football to its sporting pinnacle in just 10 years. In this entertaining, fascinating, and superbly-researched book, sportswriter Lee Price explores German football’s 10–year plan. A plan that forced clubs to invest in youth, limit the number of foreign players in teams, build success without debt, and much more. 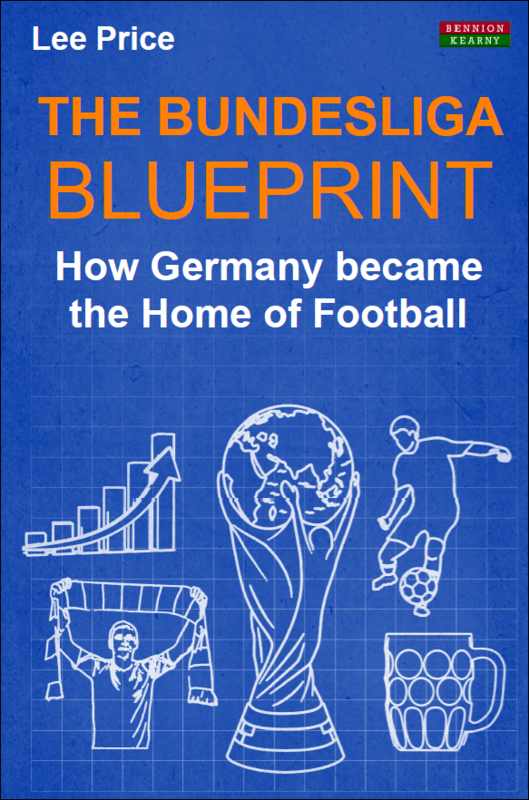 The Bundesliga Blueprint details how German fans part-own and shape their clubs, how football is affordable, and the value of beer and a good sausage on match days. The book includes interviews from Michael Ballack, Jens Nowotny and Christoph Kramer, and the movers-and-shakers behind Germany’s leading clubs including Schalke, Dortmund, and Paderborn. There is no doubt that German football is the envy of many nations. There is no doubt that, thanks to them, lessons should be learned by everyone else. Lee Price is an award-nominated national print journalist and published sportswriter who is, and has always been, besotted with football. He used to compile player lists and notes on his arms, clothes, school books and bedroom walls. Now, he does similar for a living. Previously of Shoot! magazine, Lee has been a feature writer at The Sun since 2010, where he has interviewed various sporting greats – most memorably his original footballing hero, Eric Cantona, who was as aloof and enigmatic in a hotel lobby as he was on the pitch. And Lee was as infatuated. Other objects of his footballing affection include the English lower leagues, the Bundesliga, Germany’s fan model, the faint possibility of an England World Cup win, and a good old-fashioned unlikely success story. Chapter 6: Fan frenzy: Fan = friend, see? Chapter 9: Bayern mighty: The global footballing colossus with a conscience. Kinda. Chapter 11: Culmination, coronation, jubilation. Book Categories: Lee Price, Soccer and Soccer Coaching Books.